Deckfast® Fascia System | Starborn Industries, Inc. The precisely engineered Deckfast® Fascia System includes the Fascia Tool and specially designed, color coated, Fascia Screws available in Headcote® stainless steel or epoxy coated carbon steel. The Fascia System is designed to accommodate the large amount of expansion and contraction that can occur with many composite and PVC deck fascia boards. 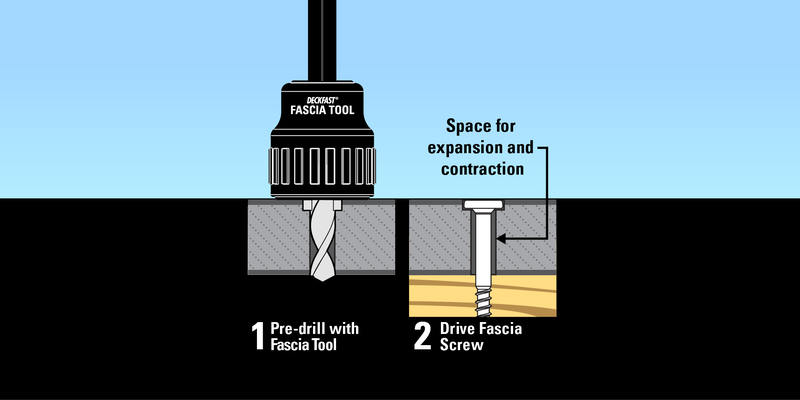 The pre-drilling tool creates an over-sized hole for the Fascia Screw, so that the fascia board hangs from the screw and can expand and contract without putting a large amount of force on the fastener. Fascia Screws feature star drive recesses and are ACQ approved. Follow the decking manufacturer's recommendation when selecting either stainless or epoxy coated fascia screws. In general, for applications where either corrosion or especially large amounts of expansion and contraction of the fascia material is a concern, use stainless Fascia Screws. The Fascia System has been evaluated and approved for use by major decking manufacturers, including Trex® and DuraLife™. 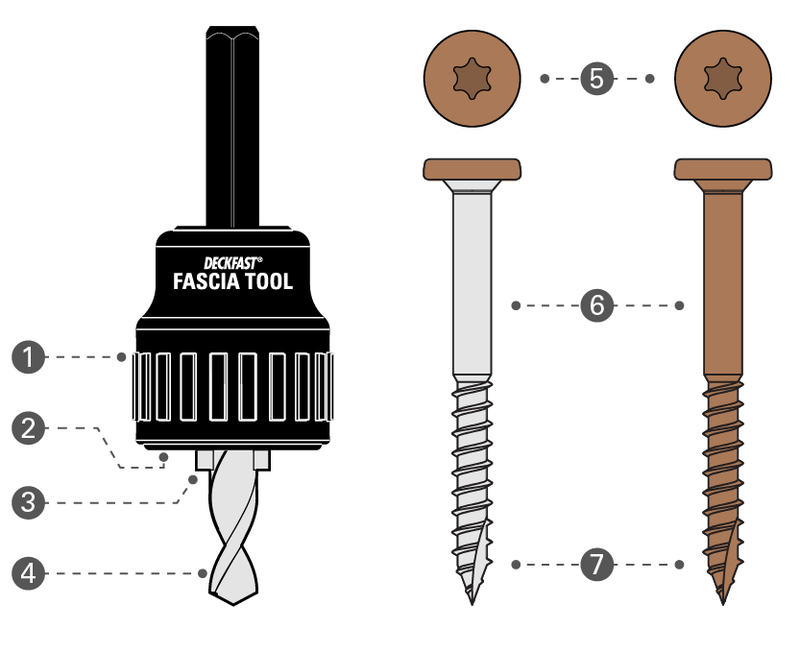 See decking manufacturer's installation guides for changes to application instructions - with the improved performance of the Fascia System (compared to standard deck screws used to install fascia), fewer fasteners may be required. For a complete guide to picking the right deck fastener, visit our Deck Fastener Information Center. Use our online Deck Matcher tool to find the right color Headcote / Deckfast color match for your decking material. The stop collar spins free of the drill bit, prevent marring or burnishing of the fascia board surface. The cavity gathers waste material, keeping it clear of the countersink. The Fascia Tool matches the head diameter and countersink depth of the Fascia Screw for the perfect hole and fit. Together with the countersink, the overall hole depth is designed for use with fascia boards from 1/2" to 3/4" thick. 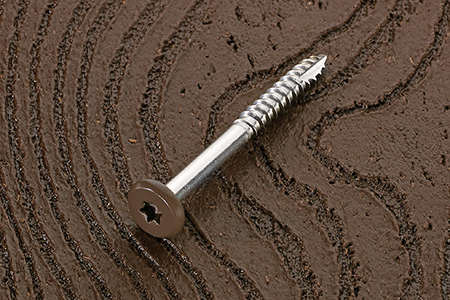 Fascia screws are available in a wide range of colors to match popular decking products. Stainless Fascia Screws are 9 x 1-7/8". Epoxy Coated Fascia Screws are 10 x 1-7/8". For faster, easier entry; helps prevent splitting of treated lumber. Deckfast Fascia System components and features. Follow the deck fascia board manufacturer's installation instructions. The Fascia System is designed for use with fascia boards from 1/2" to 3/4" thick. 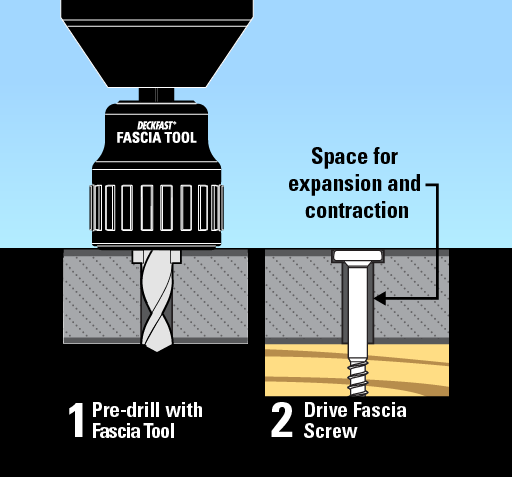 Use the Fascia Tool to pre-drill and countersink all holes in the fascia board. The hole is complete when the stop collar stops spinning. Set the fascia board in place and fasten with Fascia Screws. Drive screws until flush with the fascia board; do not over-tighten. The fascia board should hang from the screws to allow for expansion and contraction. 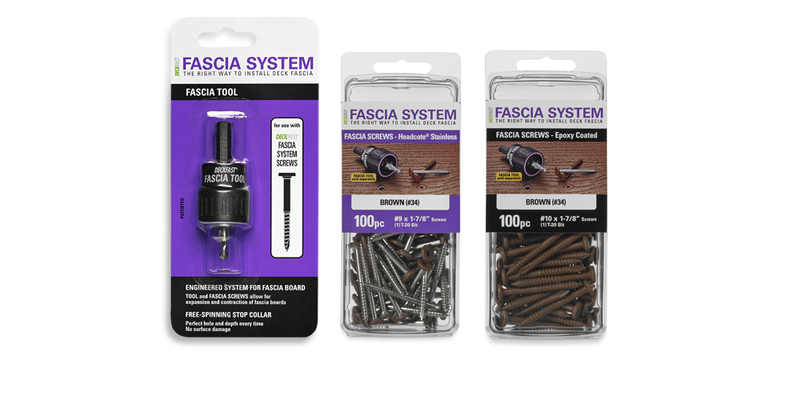 Fascia screws are available in a wide variety of colors to match popular deck fascia boards. See the Deck Matcher online color tool to find the right one.